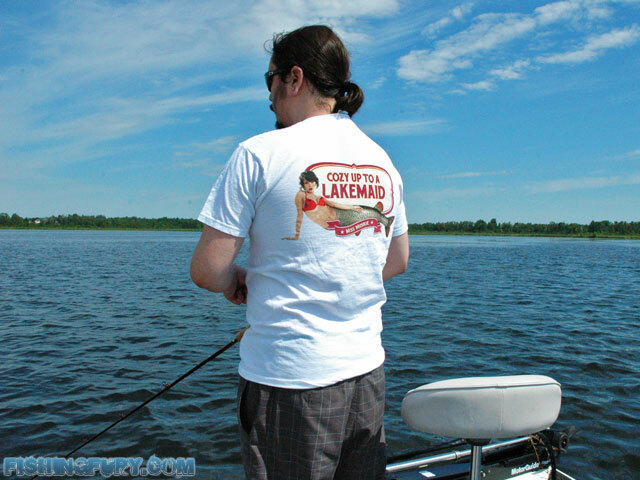 Lakemaid Beer Shirt Contest | FISHING FURY - A Fishing Blog with Attitude! We’ve reached a couple new milestones recently at Fishing Fury. Last Week we not only hit 750 total posts, but we surpassed the 1000 comments mark! To celebrate the occasion its time to give something back to you, the commenters. I’m sure most of you remember Miss Musky, our favorite of the Lakemaid beauties, well now you’ll a chance to take home Miss Musky (on a shirt of course). All you need to do is leave a comment on this post and a winner will be randomly picked in a couple weeks! The shirt is a one size fits all, XL. After the winner is chosen, I will contact them for their mailing address. Indeed, it’s a very cool shirt, but not nearly as cool as the ‘ol FishingFury T-shirt I’ve got. I know this is my first comment, but i really do enjoy your site. First time commenters are more then welcome! I’d wear it in Japan on a boat out fishing in the pacific and send you photos! A fishingfury t-shirt, too! I can’t wait for my FF shirt to be sent…but maybe i should wait in case i win this one as well and you can save on the postage, what do you mean fix!!! Wha’dya mean i can’t send 2 comments in and double my chances?! I reserve the right to disqualify Mark as I see fit! You sure an XL will be big enough for you?? You see, you’ve just gave me another chance with another comment….As for this t-shirt sizing thing, i’m going on a diet so my belly won’t be a problem on any more photo’s, and just a Large will be perfect i think for my new trim physique!!! Sweet….where can I buy one? You can still win one! But if you cant wait for the contest to end, you can buy them here. Wow – this combines fishing, free stuff, and half-naked girls. It’s pure America in t-shirt form! I’m glad I survived. Now, to celebrate, I’m heading to the lake for some slimers!!! Miss Musky!! Nice shirt guys!! Might as well try my luck! Nice looking woman, i’d wear her every day of the week! Does the last comment count as well?! I can tell you this much….If I win, the shirt would be my new fishing shirt(so it would get used a ton). I agree with Woody…..2 posts= 2 chances,no? FYI_ caught 2 Walleye here in Montreal(4lb and 6lb) trolling a Beleiver musky lure.Pics to follow after I get them from my buddy’s camera. NON PECHE POUR Greg Muskyman, i need Miss Muskie in my life, i could keep her in my aquarium and keep a close eye on her! Now I nkow why your name is Woody. She’s a nice piece of tail…..and you want her in an aquarium……PAS DE PECHE POUR WOODY! I am the “fish nazi”….NO FISH FOR YOU! Even my 14 year old son is trying to do me out of my T-Shirt, kids shouldn’t be allowed to enter! Even if he wins, it’ll be too big for him and he’ll have to give it to you Mark! Remember National Talk like a Pirate day is coming up. OH WOW, IS THERE A T-SHIRT WINNING CONTEST?…I WISH SOMEONE HAD TOLD ME, I WOULD HAVE LEFT SOME COMMENTS!!! Why are Pirates called Pirates?….Because they ARRRRRRR!…Sorry i couldn’t resist that, Talk like a Pirate day?! Hey that’s not fair if you use that as an excuse for winning Mr Greg Muskyman, i live in England and you can’t even get Musky here so i’ve got no chance of catching one!….Anyway, ok you’ve caught a Musky and i’m no expert but i’m thinking that’s not even a 100% legit Musky on the Shirt, i’m sure it’s been cross bred with a human of some sort, have you caught any like that before, and if you have then i think the Shirt should go to you! Woody…..bad joke. Are you going for the sympathy vote? WOW! A LAKEMAID BEER T-SHIRT!!! I NEED IT! A winner has been chosen! More details tonight! I have a friend whose cottage is on Lake Chemong, never fished in it although I’ve heard all the stories. I was walking in it this weekend past, paddled it too, with Alexander directing…..check out the Curve Lake Powwow sometime!!!! I worked so hard this weekend, the shirt fell right offen me, so I need that shirt more than ANYONE else! Great site!!! Garauteed once you try a lakemaid beer you’ll be hooked. Keep on fishing. Would love to be able to try that lake maid beer. Love fishing. Would love a t-shirt too. Contest has been over for a while David. Register and keep an eye out this summer!